Looking back, it was rather madcap. As I was packing to return home from Spain last year, I threw all of my empties in a suitcase and flew them back to the UK, ready to add to the rest of my August used-ups. This year I photographed and disposed of (recycled where possible) everything before I left: much more sensible, and much more environmentally sound! 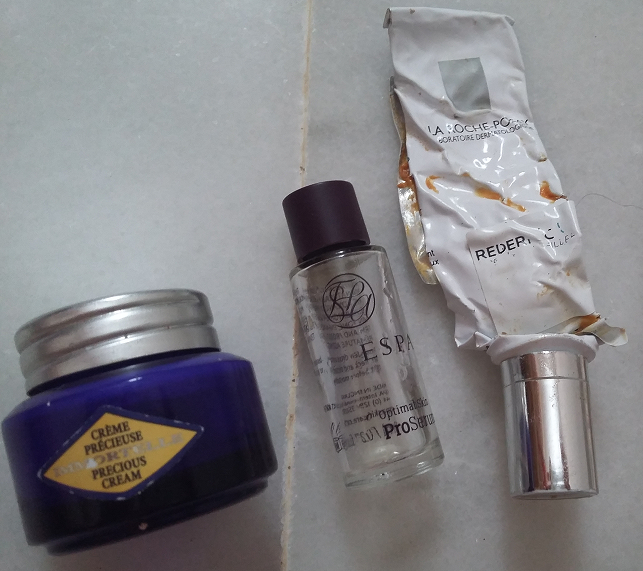 My August empties is a round-up of all the products I finished while on hols in Spain, a bit of a *departure* [get it?] from the usual monthly roll-call, which features all of my used-ups (in truth, I didn’t have that much outside of the Spanish collection). My travelling skincare comprises small and discovery sizes, usually of products that I’ve acquired as gifts with purchase, plus full-sizes of my staples. 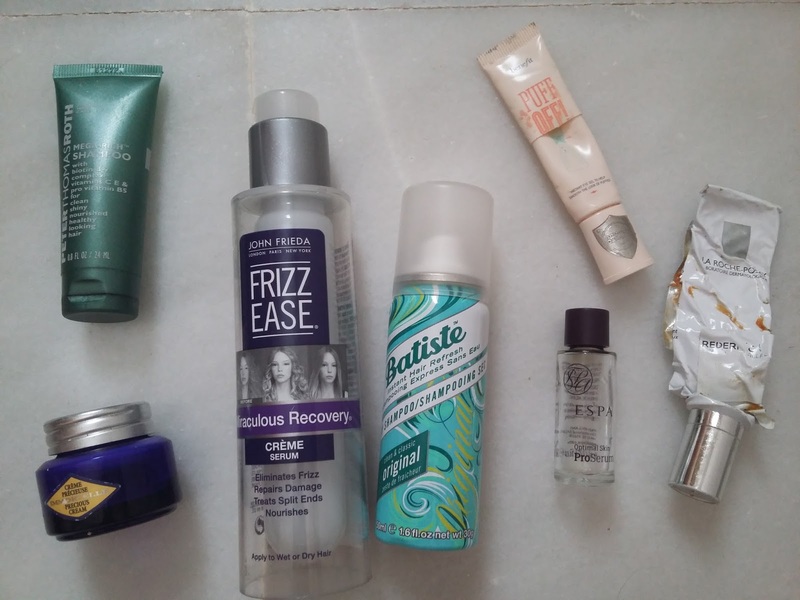 My empties pretty much reflect that mix – there are 3 haircare products, 3 skincare and one item of make-up. Espa Optimal Skin ProSerum. This is an oil serum and so I used it as both: a serum and a face oil, saving me having to take separate products and saving space in my suitcase. It has the most delicious smell and makes my skin glisten. Contains omegas and vitamins A+E. £49 for 30ml here. L’Occitane Immortelle Precious Cream. I seem to get a small jar of this most times I take advantage of one of L’Occitane’s GWP offers (join its VIP scheme - free – as it’s fantastic). Another nose-pleaser, it has a rich texture and is incredibly nourishing. £48 for 50ml here. La Roche-Posay Redermic C10. Apologies for the dog-eared look of the tube – I did a good job of squeezing out every last drop. This contains a decent amount of vitamin C (10%). It also contains vit E and hyaluronic acid. It smooths and hydrates. I’d definitely buy this again. £22.12 for 30ml here. 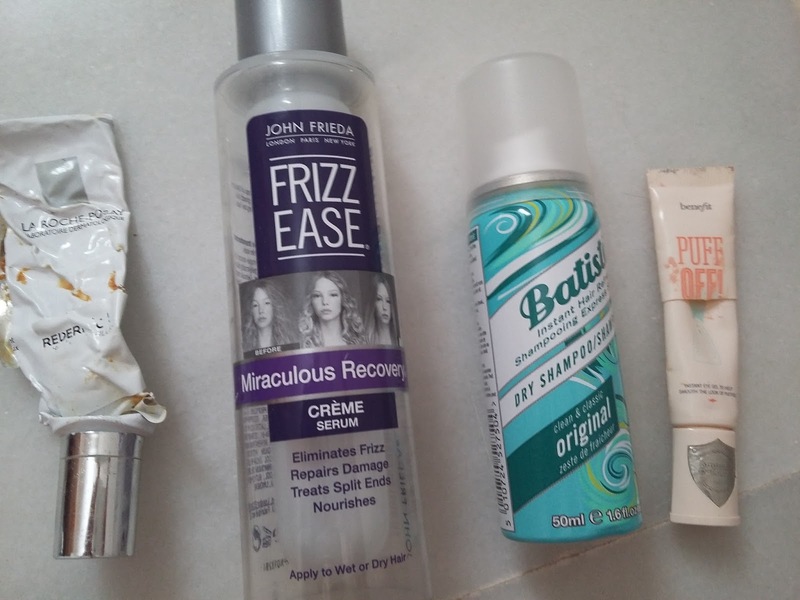 John Frieda Frizz Ease, Miraculous Recovery Crème Serum. 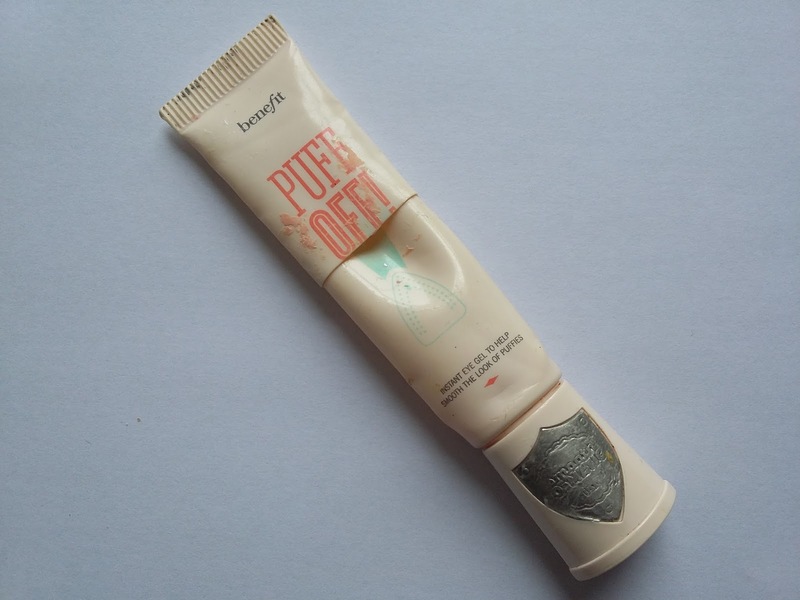 A fab dupe for my favourite (though much more expensive) Living Proof styling cream. This John Frieda formula defines curls and holds style. I buy it again and again. Full review here. Batiste, Original Dry Shampoo. I believe this is the most heavily featured product in my monthly empties. Cheap as chips and works like a trooper, ie soaks up grease, so you don’t have to wash your hair as often. 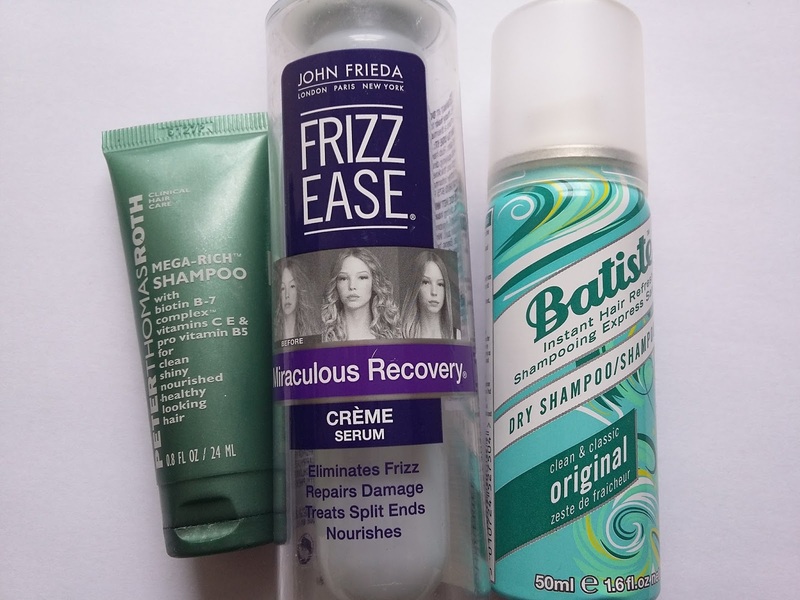 Plus I’ve just discovered that it also stops porous hair from frizzing in humid conditions –more on that here. Peter Thomas Roth, Mega-Rich Shampoo. This was part of the bathroom toiletries in the airport hotel room before our flight out. The brand must have a deal with Hilton as I seem to pick this up every year! It’s difficult to assess a shampoo from two washes (that’s as much as I got out of the tube) but this sample doesn’t make me want to rush out and buy a full size. I could only find the conditioner online, from Beauty Bay for £12.95 (235ml) here. Benefit Puff Off! I cannot sing the praises enough of this de-puffing, dark-circle banishing, brightening and hydrating serum/cream for the under eye area. I LOVE IT! Consequently I get through rather a few tubes of it. 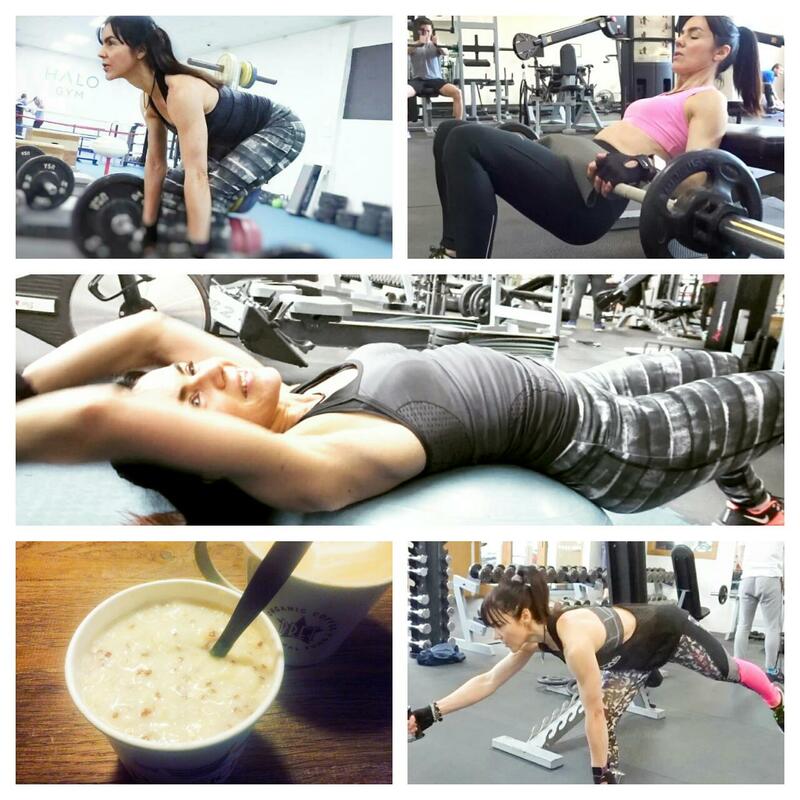 Full review (with before and after pics) here.